Recently I had occasion to make a new batch of the seed starting mix I’ve been experimenting with. I’ll do a whole post on this very soon. But to be super brief, you basically just dump stuff together and mix, and I’ve found the easiest way to do this is to just lay a tarp out in the garage and make a pile. Because I grow a lot of seedlings, this can be kinda a big pile. So I got started on the process of mixing together the seed starting mix, and then life got in the way and I had to leave this huge pile of basically dirt in my garage for a day while I dealt with other stuff. So, huge pile of dirt on a tarp in the garage. I have a four year old boy. 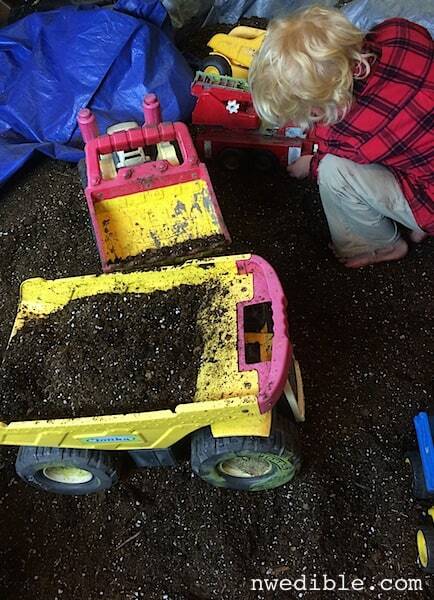 After a very suspicious period of quiet (like three minutes) I found him in the garage, barefoot with every one of his construction-type toys assembled on the seed-starting mix pile. He played in this pile of dirt totally happily for over 45 minutes, which gave me enough time to make dinner and can up some corn salsa. Now I’m just faced with an adorable, terrible decision: do I load the “dirt pile” into bins as I’d planned for storage, or do I just let him keep playing and take a few pots of my seed-starting mix off the edges as I need it? Ha! It all depends on how soon you need the garage…you know, for other garage things. God knows if its like most people’s you never actually park the car in it. You can compromise–those dump trucks would be perfect for helping you load everything into storage bins! That’s a rhetorical question, right? The answer seems obvious to me. I agree! What’s not to love? Love it! My son and daughter play in a pile of all the extra dirt leftover whenever I start digging somewhere. 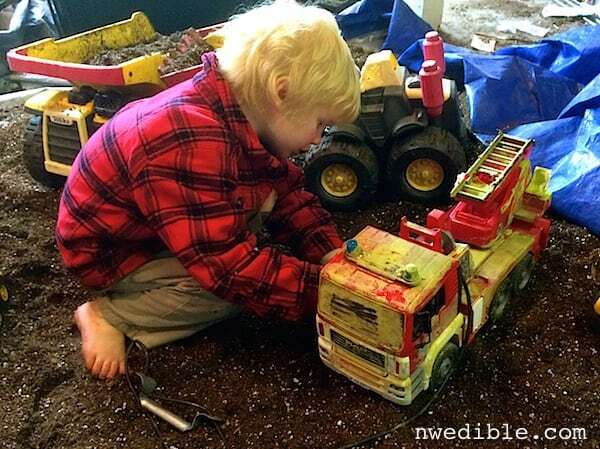 Dirt and kids just go together. This reminded me of being 10 and my Dad paving the back patio. It ran the length of the house, about 20 metres by 4, and he laid all the sand out before he started paving. ALL the sand. We had weeks of roads and hills and tunnels before our kingdom reduced to even close to normal sandpit size, because he worked full time too. Pretty sure we lost a few matchbox cars permanently under there, but it was awesome fun while it lasted. Dad used to get truckloads of potting soil delivered (wholesale nursery) and those were good fun too. Sounds like you have found a cheap and easy way of mixing all your potting mixes. Sounds like you are coming out smelling like a rose. Go for it and keep smiling. My first thought was, “the GARAGE???? ?” and then I realized oh, you have to keep it dry. My next thought was dirt traipsed into the kitchen. But that would happen anyway. Sounds like a win win situation to me. You get your mixes mixed AND the peace of mind knowing that you little one is safe and sound and really, really happy. I say leave it in the garage until it is warm/dry enough for him to play outside. He needs dirt, too. If there is some left after it warms up, then you can bin it. Oh my gosh, I laughed so hard. I have been there. My boys are 5 and 6 and playing “scoop” in the garden dirt has been an annual ritual. Sometimes, during our very long winters, We even put dirt on cookie trays, put it on the kitchen table, and let them use their mini scoopers to move it around. Hey, it can be hard to occupy little boys on long winter days! So.absolutely.adorable! 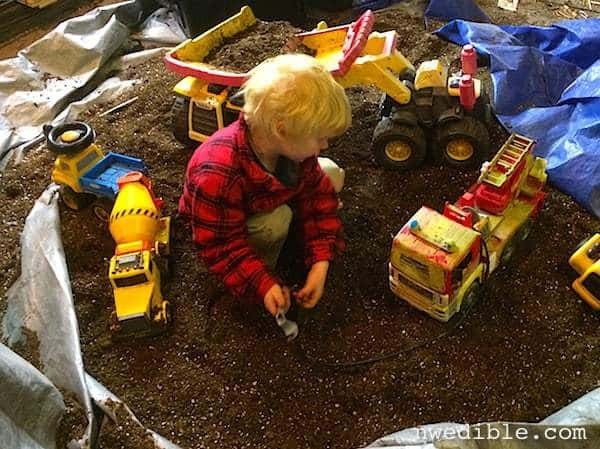 That boy is smart…what else should you do with a big pile of dirt? He saw that pile and knew exactly what to do!! No way that stuff is going into bins any time soon. Makes me want to get in there and play with him. Just don’t let the cat in there.